Amulet comes from the Latin word amuletum, meaning an object that protects a person from trouble. This differs from a talisman, which derives its name from the Greek word talein, meaning to initiate into the mysteries. So the basic difference between an amulet and a talisman is that an amulet is worn solely for protection, whereas a talisman is worn for mystical development and a wide range of spiritual benefits. Amulets derive their power through religious symbolism which acts as a conduit for the grace of the divine. Like a talisman, an amulet should be chosen according to your religious leanings and symbolism that is meaningful to you. The symbols can include images of various gods, or their totem animals, plants or gems, sacred writing, words of power, runes, symbols or images of saints or a simple spell. A gemstone can itself be considered an amulet, if it is worn for its protective qualities. Certain gems, such as carnelian, have a strengthening effect on the auras, and therefore offer a certain level of protection on their own, but are greatly enhanced if empowered with a spell or linked to a particular deity through prayer. The use of amulets has been universal in all cultures from the cavemen up until present time, as it responds to a basic human need for protection. Symbols have varied according to the type of protection needed. For example, in Egypt the frog was used to protect pregnancy and fertility, the ankh symbolised life, the udjat, or eye, was for comfort, health and protection against evil, the scarab was for protection against evil magick. 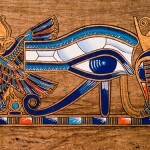 The Eye of Horus was the most universal protection symbol. It would keep one under the watchful eye of the God. 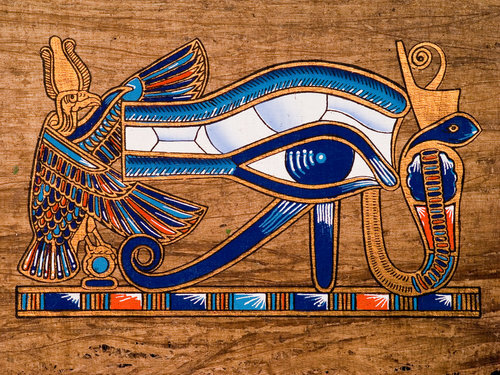 Since then, the eye has been a universal symbol of protection against the evil eye in many cultures. In Africa they called their protective amulets fetishes, which were carved in the images of people, Gods or animals. Later, more complex magickal systems used grids of numbers or sacred letters. If you look throughout history, you will see that the most successful cultures took amulets seriously. Warriors learned to depend on unseen forces for survival; forces discovered through close relationship with Nature. It is obvious that there is a lot more to it than superstition. There are three main considerations in the preparation of an amulet. The choice of symbolism, the material the amulet will be made from, and the invocation of power into the amulet. As mentioned before, the symbolism must match your religious inclination. That way, the amulet becomes a symbol of your personal faith in the unseen. You should pick an amulet made with the symbolism of the God you believe in, or feel greatest rapport with. The material should have strengthening virtues in itself, but should also be a sacred material under your religion. This can be wood from sacred trees, bones from holy animals or saints, gemstones, or precious metals. As an example, carnelian is a protective gem that is sacred to Sekhmet. 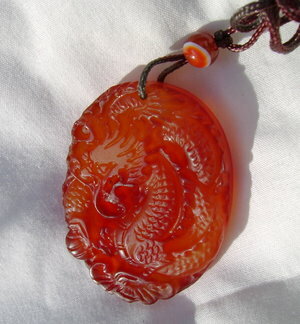 If you follow Egyptian mysteries, and you consecrate a carnelian to Sekhmet, it can become a powerful protective amulet. Other examples; in India, the Tulsi wood is sacred to Vishnu. In Indonesia, the Stigi wood is a protective amulet. In the Norse tradition, Ash is the sacred tree of Odin, into which runes are carved. The final step is the consecration. This is the step where power can vary greatly, so you should choose a practitioner of magick with great care. Never buy mass produced amulets made of pewter or other cheap metals. These are merely superstition and will not protect you. If unsure of the manufacturer, it is always best to make your own amulets, as that way you know the devotion that has gone into it. Even without knowledge of the correct rituals, simple faith and dedication can go a long way. However, for a really powerful amulet, you should seek out the most powerful magickal practitioners. As it is your protection you are dealing with, and possibly your survival, choice of practitioner should take maximum priority. 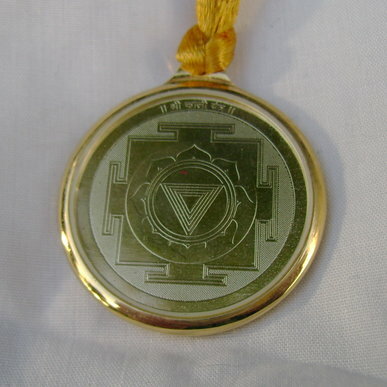 A well-made amulet can keep you safe against all kinds of calamity for a life time. There is nothing more irresponsible than selling powerless protection items to someone in need of protection. Therefore, take time to get a feel for each practitioner. Something in you will sense where real power lies. Above all, be on guard against the hard sell. True magicians do not put you into a state of panic or desperation. That is not a good energy to start with. A good magician will make you feel confident and increase your feeling of self-reliance, as well as faith in the divine. A good guideline is to seek masters within an ancient tradition. There are many new age type occultists who may be quite enlightened but lack technique to focus the power. Ancient rituals can provide a powerful focus, and someone who has taken time to learn them is probably of great experience and devotion. 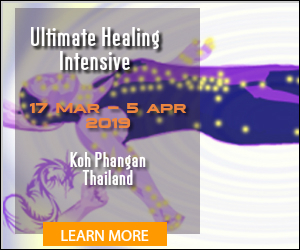 You can find such practitioners in the east, such as the Payang shamans from Java, or Islamic or Hindu saints in India. You can sometimes find experienced adepts in Eastern temples. There are very few scattered in the West, so you will need to consider very carefully and let your intuition guide you. Amulets can be prepared containing Djinns (Genies), khodams, devatas or dragons in appropriate materials. Devatas go in a yantra locket; dragons go into wood or carnelian; djinns can be put in rings or pendants; and khodams can be put in mini keris, which is a small magickal knife. For explanations of the different powers provided by these spirits, see here. This would make a great weekend course ! :0) I think its so common that, like you say, many are theoretically adept but not practically adept at harnessing the real power. Great article ! A lot of it is taught on my Javanese magick course, which can also be taken distantly. 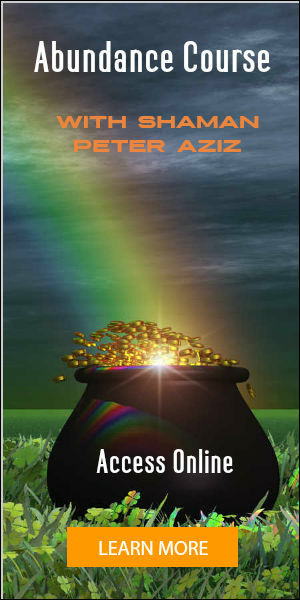 Hi, i would like to learn how to make a magickal amulet for protection against evil and against bad people. The latter levels of Javanese magick teach and empower you to create talismans. Hi, I was just wondering how I can make my own amulet protection necklace? Could you give me some advice and help me to make an easy one. I was thinking of using my silver diamond ring for protection. I would appreciate instructions or what you could tell me how to do this. How do you get orders on your site? Just click on the buttons. otherwise, just email me your order and send a paypal payment. 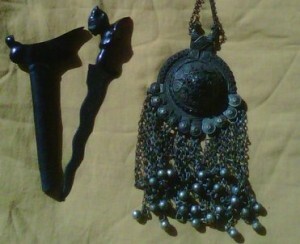 Hi, Im looking for a powerful talisman, one that brings me great things such as: love, power, good luck and protection. Something really powerful that I can feel the power emanating from it. Something that would be all purpose in my practice of magic. Could you make something like this for me? Yes I can do that. I would need more information of your path, what deity you work with, what powers you need etc. Well there r a few abilities i have that r dormant I need them awakened such as my kinetic abilities, astral projection and a few others. My deities r Hecate, Gaia, Chronus and Aeon. What other information do u need about my path? i can certainly make you a talisman for Hekate, which will connect you fully to her magick. How much would be the cost for this? 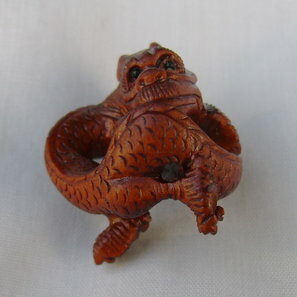 Charms and talismans are generally about £50. I have a home study course, but it isn’t as complete as being here in person. The latter is certificated.